Experience the natural wisdom of these kind and intuitive animals. Horses are masters at being in the present moment, grounding us in the here and now. What do you want to experience? What do you want to change? How would you like to grow? Learn more about your personal communication style? Enhance your intention, power and focus? Improve your personal skills with co-workers, family and others? Connect with yourself and the natural environment at a different, instinctive level? Book your 1-hour Individual Session Now! Contact Talia to book your session today! Horse Sense of the Carolinas uses Equine Assisted Learning (EAL) to help individuals become better, stronger and more successful. By utilizing the curious, instinctive nature of the horses, we help you change yourself and the world around you. 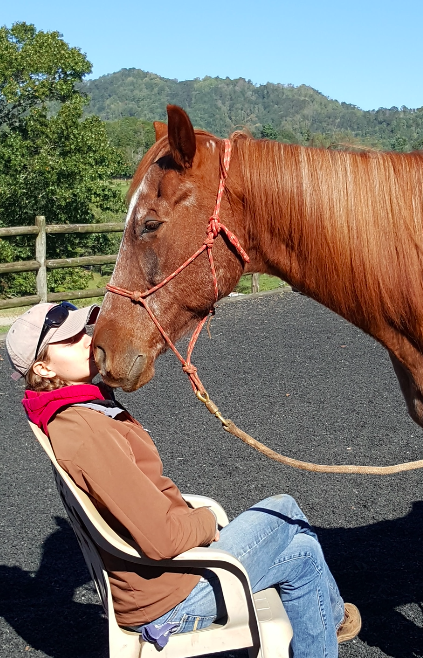 Because of the nature of the work at Horse Sense of the Carolinas, we are only able to open limited slots for sessions, generally on Friday afternoons. Private sessions are $85 for one hour. Duet sessions (you and a friend) are $50 per hour each. Small group/family/family of choice sessions (up to 4 people total) are $35 per person. A 1-hour session for exploration and feedback, or for renewal and stress reduction. We can focus on any issue/challenge or topic you like, and the horses will offer you feedback on how your current skill set is working for you. They will also give you the opportunity to change your behavior in the moment and "test out" how your new skills will be received. Three 1-hour sessions designed to address "hot issues" for you, such as how to give and receive feedback, how to coach and develop others (family or co-workers! ), how to practice self-care and self-compassion and other issues, unique to you! Contact us to discuss your program today!